I've spent the last three weeks working on a project. I'm proud of the results and decided to share. This is not about Eve Online so skip past it. Pictures and commentary will be under the cut. Hi there, I'm Sugar Kyle. Most of the time I write about Eve Online. I write enough that it probably sounds as if that is all I do. I do play other games and I write about them and sometimes about books over on Downtime Hours. Technically, this blogpost belongs on Downtime Hours and I will replicate it there. However, I am proud of myself and thought that some might find it interesting. 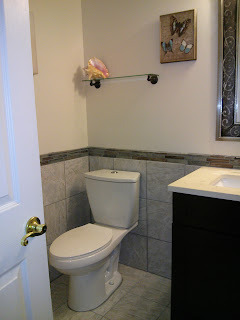 The project is a bathroom renovation. I'm rather handy and enjoy building things. I used to make sculptures of dogs and sell them on Ebay while I read forums. I should start that again, I averaged 20-30 dollars per sculpture. Anyway, I am handy and like to do my own projects. A few years ago I decided to try my hand at tiling. It didn't go very well. My next try, a year later and a lot of reading on DIY Network, came out much better. 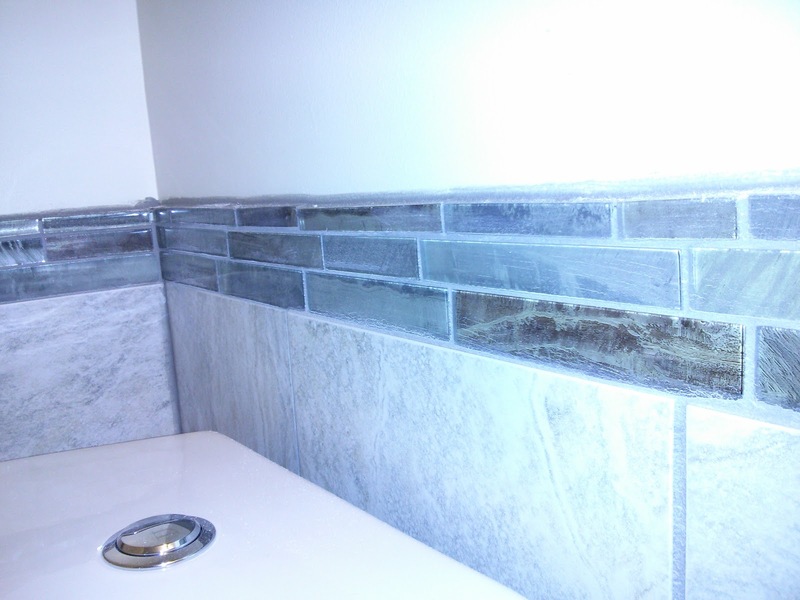 I wound up tiling all of the bathrooms in the house and really, it was a fantastic project that I was very proud of. Fast forward to buying this house. It is a very nice house but it had a stack of cosmetic upgrades that I wanted to be done. The bathrooms are all the basic builder grade bathrooms. They are boring and uninteresting and do their job of being a bathroom. 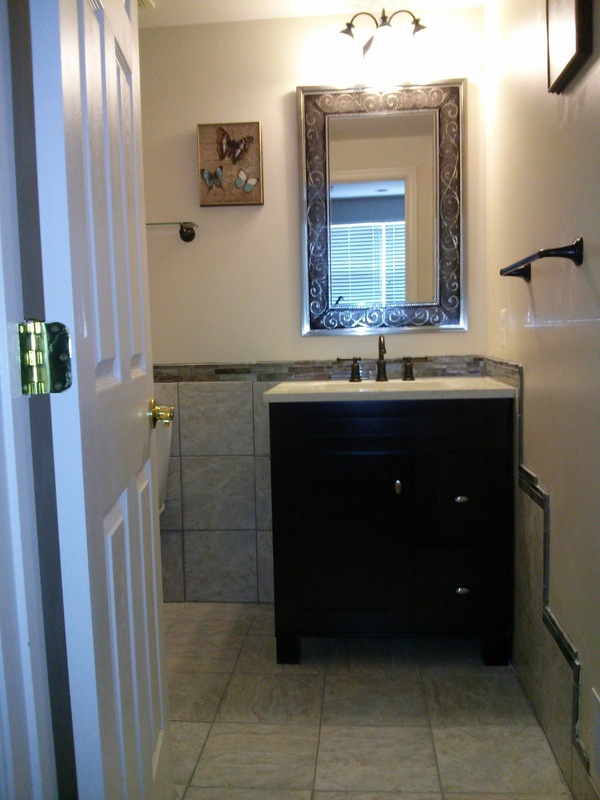 The first project was the half bath on the main floor. I live in a town house/row house in suburbia. It is a nice place with about 3k square feet, a two car garage, 3 bedrooms, 3 full baths and 1 half bath. The four bathrooms are all very boring and my goal over the next year is to upgrade all of them as well as change the flooring in the kitchen. I do this work myself but for the plumbing. 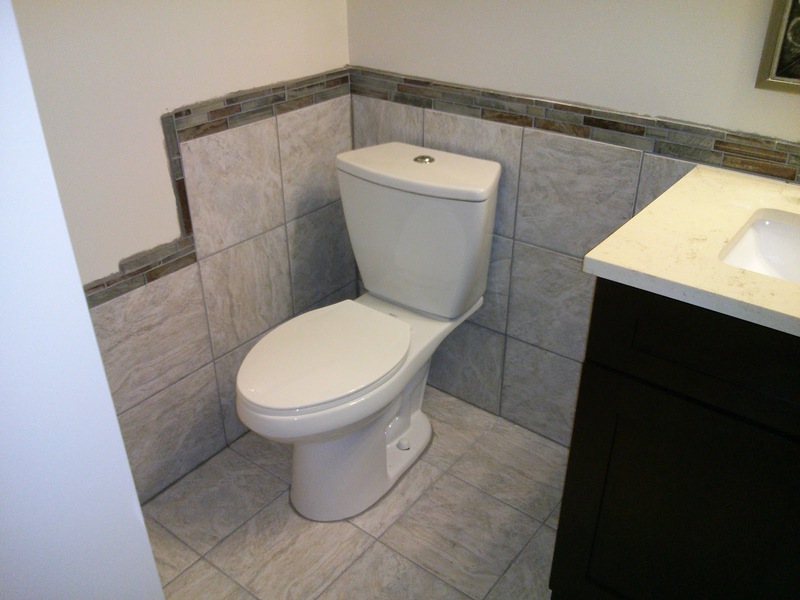 I decided to start with the main floor half bathroom because it was the smallest of the bathrooms. Also, I plan to rip up the kitchen floor this summer and replace it with tile as well. The half bath connects to the kitchen area and shares a wood floor. The wood floor is a buttery yellow color that I hate. It is a very popular floor color to put down around here. The place my mom got when I was a teenager had the same color. I've had the rest of the house redone in a cherry finish. 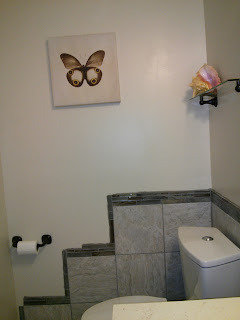 This is the basic bathroom. I pulled up one piece of wood before I decided I should take a nice before shot. 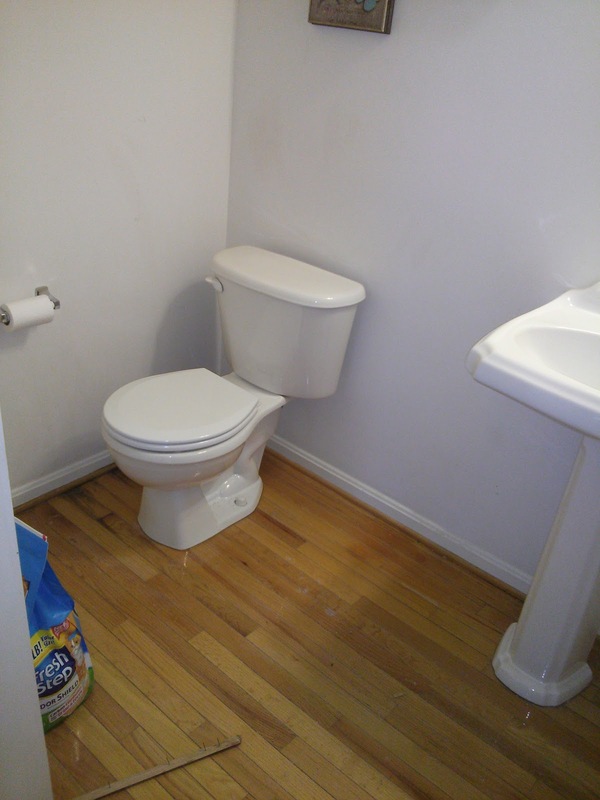 No one has ever even painted this poor bathroom. I took a week off of work and went to town on this project. It turned out that getting the wood floor up was a lot of work. The wood was stapled down and the previous home owners had coated the floor in a shiny glaze that made the pieces stick together. Instead of just pulling up the wood I had to break each board free of staples and glaze. I then had to pull up the staples. I had my sights set on a low flow toilet. My best friend and purchased a house about five years ago that had the coolest toilet with a duel flush button at the top. I wanted this toilet and the one that was there was getting the boot. The sink was also going. This bathroom, as is obvious, is very plain with little room for storage. I can't put baskets of stuff down because the cats will just sleep in the baskets and make the toilet paper hairy. 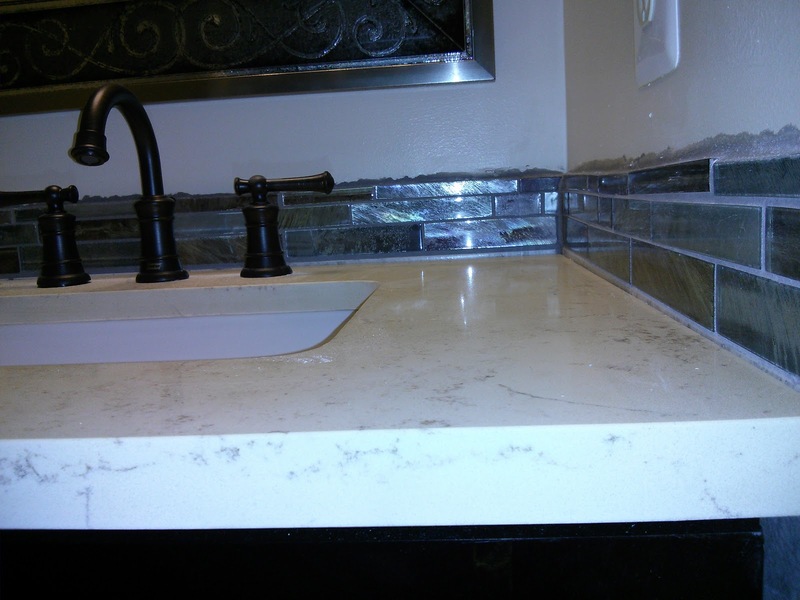 I wanted a cabinet and a sink and just some elegance added to the project. Must have pretty bathroom! I spent the next week doing all of the steps. Pulling up the floor. Putting down cement board. Laying tiles. Tiling the walls. I had a nice glass backsplash that I chopped up and rearranged into a different pattern to create a trim. Even the light got replaced because I decided I wanted to go with an oiled brass look for the fixtures. The most frustrating part was that everything I purchased from Lowes was discontinued the next day it seemed. The toilet was discontinued and I had to buy the last one. The sink was discontinued from when I picked it two weeks before and I had to pick another. The faucet was discontinued and taken off the shelves. It was ridiculous. I pushed through. I dragged cement board which is very heavy. I tiled and I grouted and I cleaned and I caulked. My caulking can use a bit of work. I have a tile saw from doing the last house so cutting was just a loud process. Every nice day I was doing things that was not cutting tiles. Every time I went to cut tiles the temperature would drop 20 degrees and go from 50(10c) and sunny to cold as all hell while my hands got wet from the wet saw. It was the least restful week off of work I have ever taken and I went back the following Monday more tired than when I left. The end result is wonderful. The sink is marble vanity with an under mount sink. I went with lots of rich and warm colors. The glass tile has a somewhat stone somewhat metal pattern behind the glass that catches the light and sparkles. 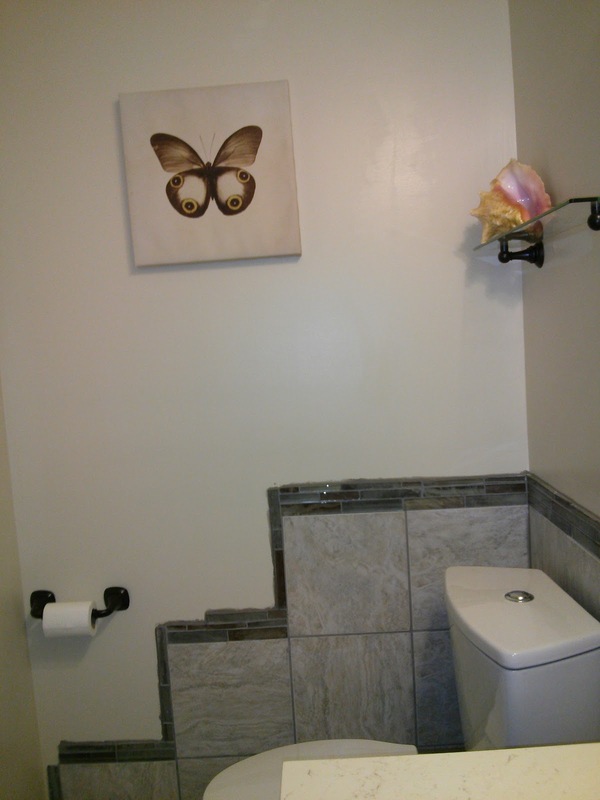 There was a bit of a delay due to having to order some pieces in but the end result is a much prettier bathroom with butterflies on the walls. It looks great! 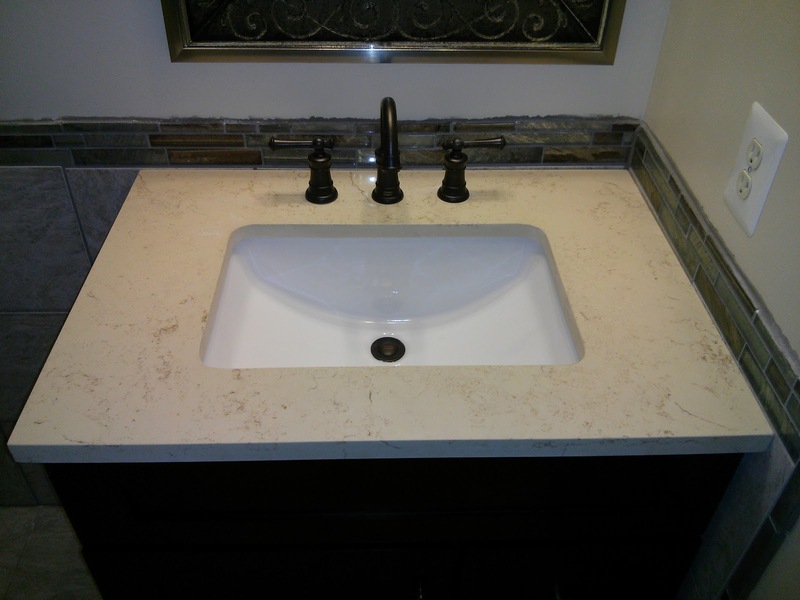 If you need help or design assistance in the future, please ask as I have been in the Kitchen and Bath industry for 18 years. As for the caulk, it's one a the few details that can be fixed for a minimal cost. Just cut it out a try again. There are plenty of tricks to applying an even bead. You tube is your friend. Thank you. I'm pretty artsy so some wandering around and looking at all the textures and colors and the image starts to form on my head. I actually like really bold colors and a lot of blue so interesting neutrals is a fun challenge. And yeah, I'll be redoing some of it. I improved greatly as I did more so only a few areas need a clean up. Thank you. I was just going to go with a simple, square mirror and I saw that and went ohh... this works on so many levels. 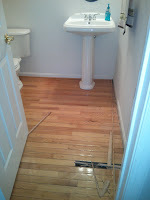 I wish I knew who places wood floor to a wet room instead of tiles? I mean the water will sooner or later make them come up or collect mold.